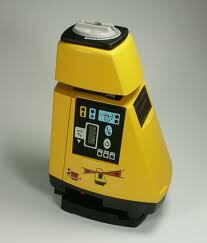 Slope Laser - Pro Shot AS2 Magnum Slope Rotary Laser with Detector and free shipping. The AS2 Magnum laser level delivers high end performance in every possible way. From the ability to set up to a 25% slope with .01% resolution to its 3300ft diameter range. Add to that a compound slope adapter and you have a laser that blows away every competitive laser product at anywhere near its price. Accuracy � 1/16" per 100', range of 3300ft.